Canadians and open water go together like pancakes and maple syrup. It surrounds us, entrances us, provides countless hours of entertainment, and allows us to have one of the most geographically diverse nations on the planet. Whether you’re from the East Coast spending time in the Atlantic, the West Coast dipping your toes in the Pacific or splashing around in any of the 2 million+ lakes in between we’re all water-logged, lake-loving Canadians. So, is it any wonder our architects take inspiration from the natural beauty of their native land? 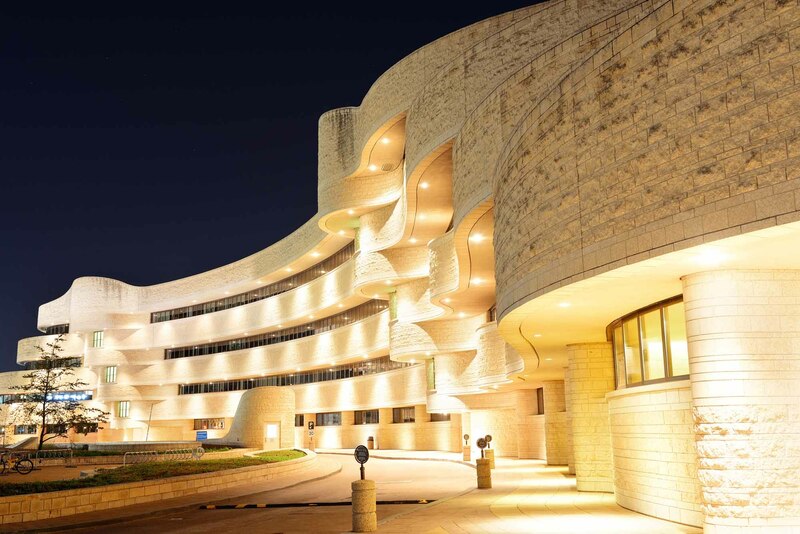 Perhaps the most famous and most original architect of a Canadian curvilinear building is Douglas Cardinal. 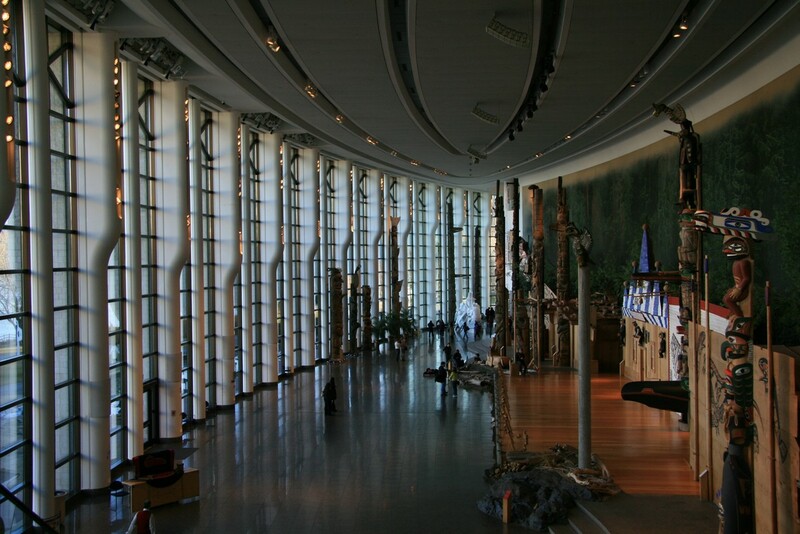 Cardinal is a First Nations architect who designed the Canadian Museum of History, located in Gatineau, Quebec. 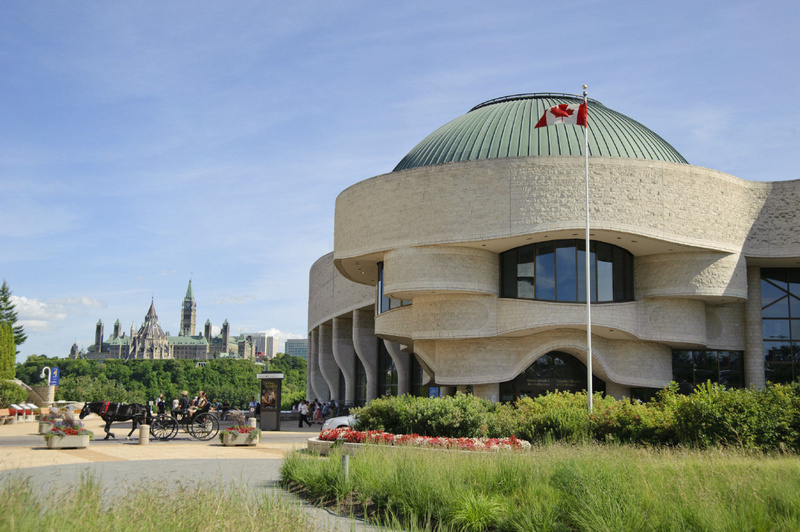 In 1989, Cardinal finished the iconic museum garnishing global attention to the curved building that sits on the Quebec side of the Ottawa River. Today, Douglas Cardinal is 81 years old, but he hasn’t hung up his protractor yet. He is currently designing Toronto’s Anishnawbe Health Ontario building located on Front and Cherry St. just outside of Toronto’s Distillery District. Cardinal’s influence in Toronto architecture doesn’t stop there. One of Toronto’s most infamous Rosedale homes, Integral House, mimics the fluid, curvilinear design that Cardinal applied to the Canadian Museum of History. The owner gave no direction or time limit to design firm Smit & Sutcliffe, his only request was curved design and a concert hall. After 10 years, 24 million dollars and 18,000 square feet the Integral House was completed in 2009. 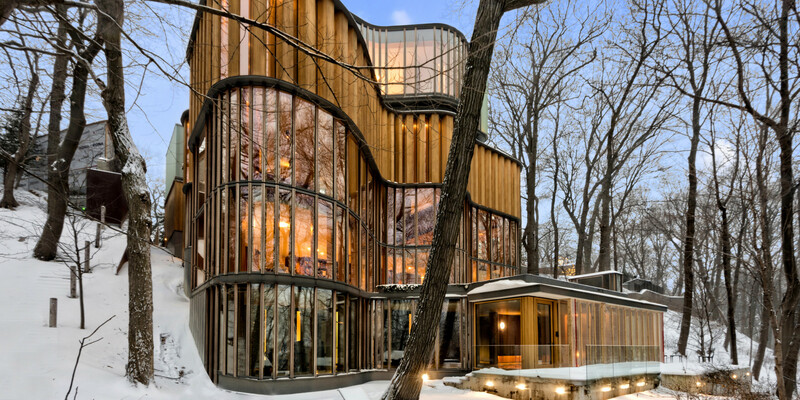 The house takes inspiration from Finnish design, and contains a 150-seat concert hall, floor to ceiling glass windows, and a glass staircase considered to be a commissioned work of art by Canadian First Nations glass artist Mimi Gellman. The curvilinear design is a welcome change to the skyscrapers and straight-edged condos that make up Toronto. But if you head onto the highway, and into the sticks you’ll see even more of this fluidity. E’terra Samara, a retreat in the Bruce Peninsula Forest, near Georgian Bay has adopted the design and taken it up a level. Literally. 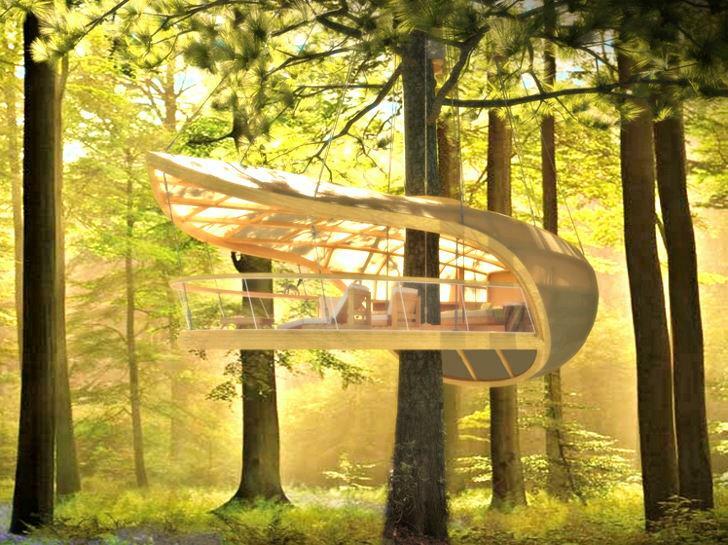 The isolated retreat is a collection of curvilinear treehouses based on the samara seed. The ‘samara’ is the propeller like capsule that falls from Maple trees in the fall. Toronto-based designers Farrow Partnership depend on sailing techniques to curve the wood into smooth wave-like shapes. The treehouses are built from locally sourced lumber, copper, salvage timbers and local quarried stone. Each samara treehouse is an original design that looks out over the Bruce Peninsula. The retreat took 3 years to build and was opened in January 2013. It can be visited year-round. Canadian architecture has many influences yet nature seems to prevail as a source of inspiration for our country’s designers. It must be something in the water.